Why Do They Say "Mush" to Make Sled Dogs Go? Why Do They Say “Mush” to Make Sled Dogs Go? M. Matthews asks: Why do people with dogs pulling sleds say mush to make the dogs go? If we relied on Yukon Cornelius from the 1964 Christmas classic Rudolph the Red-Nosed Reindeer to teach us about dog sledding, we might be slightly misled. In multiple instances throughout the movie, Cornelius cracks the whip and hollers, “Mush, mush! !” to his dog sled team. But do mushers actually say this? You might be surprised given that they are literally called “mushers” that no, not really. So why are they called “mushers” and where did the idea that they yelled “mush” to their dogs to get them to run come from? In winter it is customary in Canada, for travellers to put dogs before little sledges, made on purpose to hold their cloathes, provisions, &c. Poor people commonly employ them on their winter-journies, and go on foot themselves. Almost all the wood, which the poorer people in this country fetch out of the woods in winter, is carried by dogs, which have therefore got the name of horses of the poor people. They commonly place a pair of dogs before each load of wood. I have, likewise seen some neat little sledges, for ladies to ride in, in winter; they are drawn by a pair of dogs, and go faster on a good road, than one would think. A middle-sized dog is sufficient to draw a single person, when the roads are good. Why Do Judges Wear Robes? Why Do Drawn Hearts Look Nothing Like Real Hearts? Why Do Men Snore More Than Women? Although sled dogs demonstrate a high level of endurance (with the fastest capable of running around 1,000 miles in about a week, eating up to 12,000 calories per day despite the dogs themselves typically only weighing 50-60 pounds), the humble hummingbird has the “highest mass specific metabolic rates” among vertebrates. Everyone knows about the Jamaican bobsled team, but what about the Jamaican dog sled team? 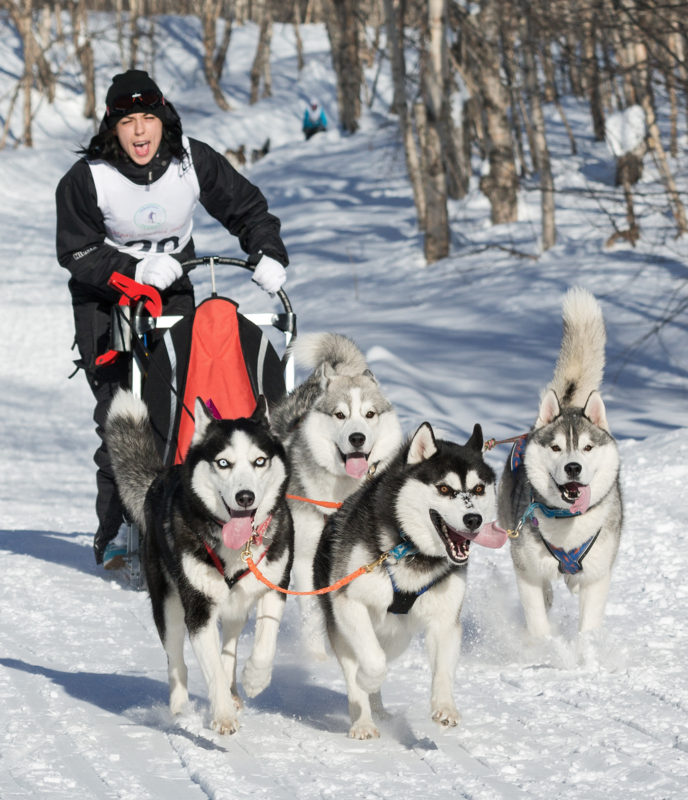 Following the example set by his fellow Jamaicans, a Caribbean tour operator Newton Marshall put together a dog sled team to compete in the winter races, originally competing in the 2010 Iditarod. The Iditarod is arguably the most famous dog sled race in the world. In Ingalik and Holikachu languages “Iditarod” means “distant” or “distant place.” The race itself was named after the Iditarod trail, which in turn was named after a former prominent gold rush town, Iditarod, that lay along the trial. Today, the town of Iditarod is completely abandoned. Dog sledding reached its peak in Alaska during the gold rush days. However, the introduction of snowmobiles and airplanes caused a huge decline in canine transportation and by the 1970s dog sledding had become almost nonexistent. In 1973, Joe Redington, Sr. organized the first ever Iditarod race, in part to promote a resurgence of dog sledding and in part to bring recognition to the Iditarod trail which was used in the historic Great Race of Mercy. The Great Race of Mercy occurred in 1925 when the Alaskan town of Nome was threatened by an outbreak of diphtheria. The diphtheria antitoxin they had on supply had expired and since winter had settled in, the only way into the town was by plane or dogsled. Since the blizzard-like conditions made flying near impossible, they decided to use sled dogs to transport the medicine 674 miles across Alaska. Normally the trip took about 30 days by dog sled, with the record at the time being 9 days. The temperatures were not helping, at a 20 year low (-35 degrees Fahrenheit with gale force winds causing a significantly lower windchill). Nevertheless, a relay team of mushers and their dogs was organized and the race to save lives began. Though mushers and their teams experienced white out conditions, heavy winds, shifting ice, injury, frostbite, fatigue, and subzero temperatures, they managed to successfully complete the mission in a mere five and a half days, delivering the lifesaving medicine in time to prevent a widespread outbreak, though several people still died before the medicine arrived. Although dog sled races are dominated by men, there are many notable women in the sport. For instance, Libby Riddles was the first woman to ever win the Iditarod, doing so in 1985. Susan Butcher won the Iditarod race four times, including three in a row from 1986-1988, then finishing second in 1989, and then winning it all again in 1990. She also finished in the top ten in fifteen consecutive competitions she completed from 1979 to 1994. The lone exception during that time span was 1985 when she was forced to withdraw after a moose killed two of her dogs and injured the other thirteen during the race. The only person to win the Iditarod more than Butcher was Rick Swenson who won in 1977, 1979, 1981, 1982, and 1991. At the beginning of the Iditarod race, a red lantern is lit and is not extinguished until the last team crosses the finish line. While most sports and competitions award only those who are the best, the Iditarod saves an award for the team that comes in last. As part of tradition, the Red Lantern Award is given to the last team to cross the finish line, no matter how long it takes. (It being seen as an extremely notable accomplishment to finish at all, regardless of finishing time.) The musher who received the Red Lantern Award with the longest time was John Schultz with a time of 32 days, 15 hours, 9 minutes and 1 second. Today the teams are drastically faster. For instance, Celeste Davis received the award with the quickest time that nonetheless resulted in last place at 13 days, 5 hours, 6 minutes and 40 seconds. Gee! : Turn to the right. Haw! : Turn to the left. Come Gee! Come Haw! : Commands for 180 degree turns in either direction. On By! : Pass another team or other distraction. Line Out! : Command given to the lead dog to pull the team out straight from the sled. Used mostly while hooking and unhooking dogs into formation to pull the sled. Thank you for this well-written and informative article. January 2016, my son, and I went to Upper Michigan and spent 2 days dog sledding where a family breeds and trains Alaskan Huskies that are used in the Iditarod. 20 miles each day, about 2 1/2 hours. We each had our own sled and a 5-dog team. It was absolutely wonderful fun. Would like to do it again sometime. The French and the aboriginals in Quebec and Acadia got along quite well. The history in Canada was totally different than in the USA. Of course the people in the Gaspe used dogs because there were no horses in this part of North America. The Spanish brought horses to the new world but the Spanish did not go to Quebec.